I booked this as an alternative to a Hotel as I needed somewhere to base myself for an afternoon/night/morning in between business meetings at different parts of the country so that I could work . Spacious,clean & comfortable 2 bed apartment for the price of an average hotel-good Wifi ,kitchen to cook a meal if you want to,tea/coffe/milk provided-secure car park space-comfortable bed,.This suited me perfectly. They rang me the morning of my stay & emailed me with instructions-slick operation. The property was spotless, really easy to find and within a few minutes of supermarkets, shops restaurants etc. Everything was so easy - the owners have really thought about putting their guests first. Warm, impressively clean, modern, good quality furnishings. The bed was comfortable and the bedding was fluffy. Well equipped apartment with good wifi, nice touch with hand wash, dishwasher tablets - you didn't really need to buy anything. Coffee, tea & sugar also there even though we did take our own. Local to city centre. Bridge apartments was far better than we expected. Parking was free and easy. Access was easy with all the codes sent the morning of arrival. Communication was wonderful (thankyou Jenny) the apartment was spacious and well appointed. Totally clean and everything we needed. Very comfortable bed and great shower. Lots of big fluffy towels. The location is easy to wander into town. Cracking place. Good location for my work whilst in the area. The Apartment was clean with modern appliances in the kitchen. Wifi speed and strength was good. Comfortable furnishings throughout, nice apartment. Parking is on site within a private and secure car park. very spacious and clean apartment with all mod cons. Proprietor was always available by phone if needed. Secure parking in a multi story with private parking bay. Lock in a great price for Bridge Square Apartments – rated 9.1 by recent guests! Bridge Square Apartments This rating is a reflection of how the property compares to the industry standard when it comes to price, facilities and services available. It's based on a self-evaluation by the property. Use this rating to help choose your stay! One of our top picks in Lancaster.Located in Lancaster, within a 10-minute walk of Trough of Bowland and 0.8 miles of Cathedral Church of St Peter, Bridge Square Apartments has accommodations with a flat-screen TV and a kitchen. Free WiFi is offered. Lancaster Castle is 1.3 miles from the apartment, while Lancaster University is 3.8 miles from the property. Leeds Bradford Airport is 59 miles away. When would you like to stay at Bridge Square Apartments? This apartment features 2 bedrooms, including 1 bedroom with a king-size bed and a second bedroom with 2 single beds. A double sofa bed is also available in the lounge. It has 1 bathroom. A fully equipped kitchen including an oven, a stovetop, a microwave and a dishwasher is provided. There is 1 secure parking space provided and bike storage is available. They say it's all about location, location, location and this property is just 5 minutes walk to the city centre so it's pretty much spot on. Lancaster has everything you'd expect from a city with restaurants, cafes, bars, theatres, parks and much more you are sure to be entertained during your stay. We hope you like the fact that each bed has the option of soft or firm pillows, kitchens are equipped with the basics e.g. salt & pepper, cooking oil, measuring jug, whisk, mugs, glasses, crockery etc for 6 people. If there is anything missing that you feel would have made your stay a better one do let us know so we can include it for future guests. Happy local business woman and mum. 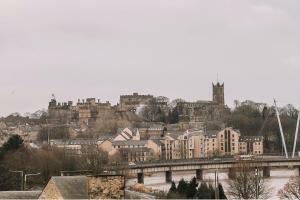 Lancaster has the beauty of being on the boarders of north Lancashire, Cumbria and North Yorkshire making it an ideal base to explore the Yorkshire Moors, The Dales and The Lake District. 10 minutes drive from the property you can be at the coast looking out to peaks of The Lake District while enjoying the sand, sea and promenade which is perfect for a stroll. Maybe you prefer some city life, well there's plenty of that too with theatres, cinemas, bars, restaurants and much more. Why not come and see for yourself. House Rules Bridge Square Apartments takes special requests – add in the next step! Debit card Bridge Square Apartments accepts these cards and reserves the right to temporarily hold an amount prior to arrival. Bridge Square Apartments accepts these cards and reserves the right to temporarily hold an amount prior to arrival. This property offers a free clean and laundry change every 7 days. Late check-out without the property's prior agreement will result in a GBP 100 fee. Please inform Bridge Square Apartments of your expected arrival time in advance. You can use the Special Requests box when booking, or contact the property directly using the contact details in your confirmation. Couldn't find fault with the apartment. Will likely be staying again when working back in the area. The communication from the hosts was clear, however, I found the number of emails a bit much and the content could have been shorter. I found myself re-reading the same information I had been given, as I wasn't sure if there would also be new information. Doors to the building left open and easy access to the car park, as a lone female I didn't feel entirely safe with this. The filter coffee was excellent!! Comfy bed...really good pillows ! Very clean, surprisingly quiet. Appreciated that there was milk in the fridge on arrival. Beautifully clean. Beds very comfortable . The host is very nice and patient to explain how to assess to the apartment! The instruction are very clear as well! Meticulously clean, modern, comfortable, all mod cons, felt like home, excellent! All good. Little complicated on arrival but if you follow guidelines works well. No.bering in car park bays confusing. Clean, well equipped and central - all good. The modern feel, the cleanliness, cosy even in a big flat. Everything we needed for an easy family weekend . Even had baby cot amd high chair put in for us. Only slight criticism would be the ill fitting window in the bedroom let in a bit of a draft and some rain. We were experiencing Storm Gareth at the time however! Communications after booking and prior to arrival were excellent. Only slight criticism would be the ill fitting window in the bedroom let in a bit of a draft and some rain. We were experiencing Storm Gareth at the time however!